As sure as night follows day, there will be always be another animal-themed video slots just around the corner. They vary in quality, of course, with big progressive jackpot games like Microgaming's jungle-themed online slot, Big Kahuna, heading the way. Th developer's Alaskan Fishing took a different tack, and it's developer Cryptologic's new take on the teddy bear's picnic, Fire Flies, which sees a hungry bear gunning for the bees' honeypots. OK, so the important points. 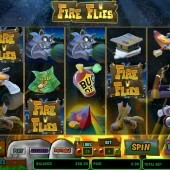 Fire Flies is a 5-reel, 25-payline video slot, with all the standard features you would expect from a Cryptologic slot. Although bets start at just $0.01, bet big and the game can offer a massive jackpot - $50,000 if you play your bears right. The bear with his sticky paw in the bottom of a honey jar, a raccoon, tent, Swiss army knife, fishing rod, jackboots and bug spray: yep, we're definitely in Call of the Wild territory here. Speaking of which, the Wild symbol substitutes for all symbols other than the fiery bonus symbol. The bonus, when appearing on Reels 1 and 5, triggers seven free games. A 2x multiplier also takes effect on your win when the free spins are triggered. Not only that, but during the free spins an Expanding Wild appears at random to win you more cash. 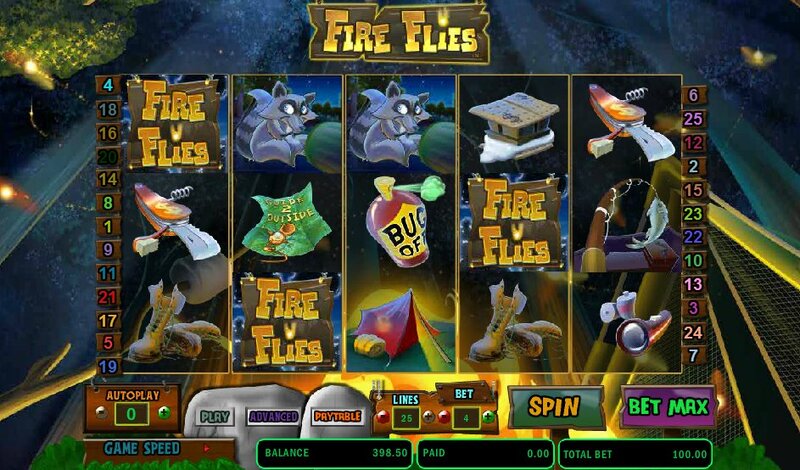 Free spins is basically your lot here, but with a nice gentle theme making this a decent addition to your favorites list if you're a fan of the Great Outdoors, together with a very attractive jackpot, Fire Flies could be right up your street.